Banknote grading on BOB and SA in general. I have had so many issues with grading on BOB and with grading in general in SA. UNC means a note that is perfect. A note that has no folds, stains, holes, staple holes, corners, creases, rounded corners, counting flicks or any other imperfection for that matter. UNC does not simply mean a note that has not been in circulation. So a note (believe me, there are listings as such) CANNOT be "UNC with a slight fold"
The issue I have with miss-grading is that it causes hassle and costs money to return items. If a seller cannot grade a note properly, he should rather not attempt to do so, learn how to do it, or just not sell banknotes at all. Please, please let the SA market move towards an international, accurate and fair way of grading. I have spoken to some SA dealers that have been around too long, and they accuse the younger collector of being too finicky. This might be true, but that is the way the market is moving, and so what of we want the best? So what if we want what we paid for? I have spoken to some SA dealers that have been around too long, and they accuse the younger collector of being too finicky. This might be true, but that is the way the market is moving, and so what of we want the best? So what if we want what we paid for? When it's a buyers' market, only the best is good enough ... plus you don't need to pay a premium for it. To this end, I think BoB should allow high-resolution images in the money and stamps categories ... a sub-50KB JPEG just doesn't hack it. I try to post as clear an image as possible which is why it takes hours just to do the photo's! But i must agree, some people think that a fold in the middle or a bent corner is still UNC. To me, it's not. There is nothing more annoying than a note that's "in crisp condition" and when you get it, it looks like someone had it in their shoe for a year. The issue in SA arises from the misinterpretation of the word uncirculated. In its simplest form, yes it means a note that has not seen circulation. But furthermore it refers to a grading term that indicates the condition of a note. So, a note that comes crisp from the bank, stuck in a book, handled, folded, but yet never sees any real circulation is not UNC! I you go look now there are listings such as "Crisp uncirculated with paperclip mark". These sellers obviously do not know what they are on about. It is of my opinion that if you dont have a clue, to rather refrain from dealing in banknotes at all. If you false advertise you should be reprimanded. On Ebay there is the feedback system and Paypal more often than not is in favour of the buyer. On BOB on the other hand I don't feel that support. If you leave a negative feedback on BOB, the seller can just reciprocate. Ultimately I think that in SA, sellers take the objection of grade as an insult, whereas everywhere else in the world it is either graded correctly, or when a mistake is made, sellers endeavour to fix their wrongs. A note that has any fault on it be it a fold, pinhole, crease, tear bends etc cannot be regarded as UNC. As most numismatic books define an UNC specimen note as being perfect, there is no room whatsoever for compromise when it comes to the UNC grade. However one must raise the question, should an UNC note be allowed to exhibit certain characteristics in the same way as UNC coins eg. Scraper marks, field blemishes, and toning spots? PMG grading allows for different grades of UNC. It ranges between 63 and 70. Choice UNC and GEM UNC in other words. It has to be remembered though, that these grades are established by professional graders, and that when determined is labelled as such and the buyer knows exactly what he is buying. I shudder to think sellers on BOB trying to use this grading system when they cant even get the basic 3 level grading system right. Stepping stones I N collectables...stepping stones. Yes I did pick up on that, and I think that has to do with the paper quality of the note. And like you said it is established by trained professionals. 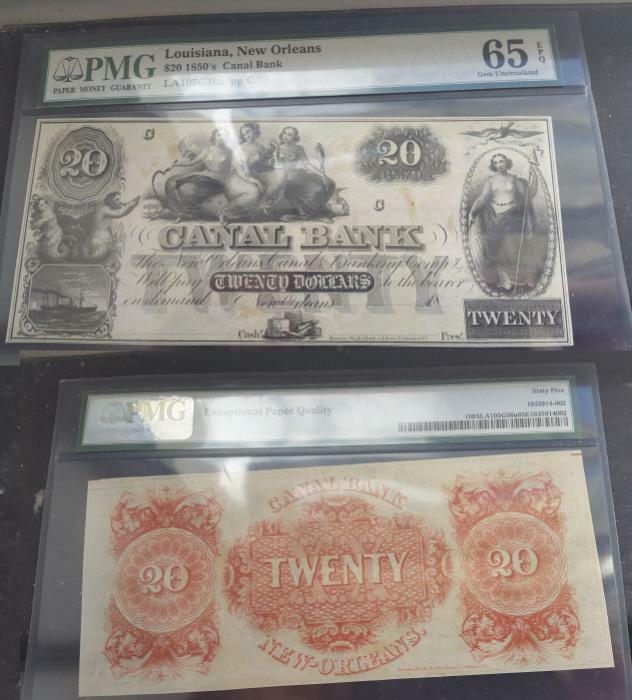 Perhaps more awareness needs to be created around the subject of paper money grading so that everyone and anyone who has an interest in buying or selling banknotes has a background knowledge of the subject and thereby increasing awareness and interest in the great hobby of numismatics as a whole. However one must raise the question, should an UNC note be allowed to exhibit certain characteristics in the same way as UNC coins eg. Scraper marks, field blemishes, and toning spots? IMHO, a scrape mark or "blemish" of any kind automatically disqualifies a coin from the top grade. Period, because by allowing it the grades are watered down for monetary gain. If they give you any history on it i would love to know! It's a beautiful note! I can perhaps help you with the value of this note,since it is the very same note i sold on BOB on 21 July this year for R1200,bidorbuy ID: 154443131. I bought this note on Heritage(In dollars of course) for approximately the same amount I sold it for . I don't collect banknotes at all but i suspect that the issues you describe are generic to sellers of collectibles generally. I believe the BoB feedback system is better than eBay's. A feedback system that doesn't go both ways is a farce because it makes the one for the buyer pointless and I make this comment as one who does more buying than selling on eBay. Ultimately, the system is based upon trust and those who leave negative feedback out of pure spite I believe both undermine the system for everyone and I don;t see that they are going to last long as a seller either. Another problem today with eBay is that sellers are provided with discounts on the fee for good ratings, not just the number and percentage of positives. Its something I only recently became aware of because I have never been a large volume seller. I found this out first hand when i had the "audacity" to leave soemone a "neutral" rating for not properly describing an ungraded coin I bought and when they ignored the multiple messages sent to them requesting a return, that is when I left the "neutral". This seller (whom some of you know) actually deserved a negative but I didn't give it to them. Then when I went to bid on one of their lots, I found I was blocked. This seller is known for being a "prick" but I also suspect that he also blocked me because the "neutral" I gave him will jeopordize his diccounts if he gets a few others from other buyers. On your last comment above, what you are describing is a perennial problem with dealers generically. There are dealers out there and they exist everywhere who assign one (higher) grade when selling and another (lower) grade when buying the same item. Anecdotally, I understand thsi was very common in the United States before TPG and probably still is for coins sold "raw". I suspect it equally applies to banknotes. I further suspect that it less of a problem now since collectors can bypass these dealers with the internet (eBay, BoB and non-local dealers) but still exists. I also don't see any reason to believe that South African dealers are any worse than those in the US or elsewhere. I have no direct knowledge of it but just don't see any reason to believe otherwise absent evidence to the contrary. Unfortunately, there are just some dealers (and collectors) who try to make a buck or a Rand by cheating others. Dealers have traditionally just been more successful at it because they have the knwoledge advantage and more potential buyers than the collector. I have no direct knowledge of it but just don't see any reason to believe otherwise absent evidence to the contrary. Banknote grading in SA id bad. Not just with BOB...but do yourself a favour and go take a look. I speak from first hand experience. You are however right when you say it happens everywhere...but I trust grading on Ebay infinitely more than I do on BOB. I have in the 8 years of mostly buying on Ebay, only contested maybe 5 or 6 notes. The sellers accepted the dispute, and and issued a refund with an apology. I think these issues were resolved amicably because of the rating system. Its a system that punishes shabby customer service.